The UGI Columbia Gas Plant site is located on less than 1 acre in an industrial area of the Borough of Columbia, Lancaster County, Pennsylvania, near the Susquehanna River. Site soils and groundwater became contaminated due to the manufacture of gas products beginning in 1851 and ending about 1950. The Remedial Investigation (RI) identified approximately 16,000 cubic yards of contaminated soils and between 345 and 34,500 gallons of DNAPL in fractured bedrock under the site and under surrounding land parcels in the site vicinity. The DNAPL source has been present for about 150 years. A dissolved phase plume has also been identified near the DNAPL. This dissolved phase plume discharges to the Susquehanna River, where it becomes significantly diluted below state of Pennsylvania water quality standards. From 1851 to 1935, the Columbia Gas Company (Columbia Gas) used the site for manufacturing gas for distribution in the City of Columbia. The site changed hands several times, with subsequent owners including PP&L Co., Lancaster Gas, UGI Utilities Inc., the Crouse family, the Roach family, the Judd family, and PPL Electric Utilities. PPL is the current owner of the MGP Facility (USEPA 2016c). Gas was historically produced at the site through a coal gasification process which included reacting steam with hot coal, coke, and wood. The gas went from two gas generating sets through a washbox, condenser, washer cooler, and then was stored in a gas holder. From the gas holder, the gas went through a coal tar separator and a purifier and finally to a relief holder for distribution in the City of Columbia. The primary waste streams generated during the coal gasification process were liquid coal tar, boiler ash, and spent gas purifying materials. Coal tar is a mixture of volatile organic compounds (VOCs) including BTEX; semivolatile organic compounds (SVOCs) including polycyclic aromatic hydrocarbons (PAHs); and inorganics including metals and cyanide (collectively referred to as “MGP-related wastes”). Coal tars were generated from the coal tar separator, which separated coal tar from liquid waste. The coal tar separator received liquids from the washer cooler, drip pumps, and overflows from the gas holder. Coal tars generated from the tar separator were stored in the relief holder pit, which had a 46,000-cubic foot capacity, to allow for separation of the tar/water emulsion. The relief holder pit was constructed of riveted steel plates and was held within a pit that was approximately 30 feet deep. The relief holder pit failed in 1947, and its foundation was used, thereafter, for tar separation. Marketable coal tar was removed for sale and below-grade tar was left in the pit. Overflows of the tar separator, which occurred during periods of heavy rainfall and in the winter, were discharged to an open ditch that led to the Susquehanna River. The purifier wastes were generated from iron-oxide treated wood chips arranged on wooden racks. When the wood chips could no longer be regenerated, they were removed from the purifier. The wood chips were subsequently disposed of on site as paving and dust control material. The wood chips contained cyanide, which is a contaminant of concern at the site. MGP operations at the site resulted in the release of VOCs, PAHs, heavy metals, and cyanide into soil, groundwater, and surface water at the site (USEPA 2016c). To address contamination remaining in site soils, two caps have been installed. Contaminated sediments in the Susquehanna River have been excavated and disposed of off site. The contamination remaining in groundwater consists of a dissolved plume and between 345 and 34,500 gallons of approximately 150-year old DNAPL. The range in this estimate is primarily a function of the estimated potential variance in the fractured bedrock pore space in the DNAPL source area. The DNAPL is composed of tar-like liquids resulting from the former MGP operations which do not easily dissolve in water. The DNAPL is located within fractured bedrock (karst terrane) and under adjacent properties. The DNAPL is located mainly in two fracture zones, which are oriented in an east-west direction and extend approximately 880 feet away from the source area. The more soluble and mobile fractions of the contamination have likely been removed through natural attenuation processes, leaving behind the largely immobile fractions of the original DNAPL. A dissolved phase plume has been identified near the DNAPL. Since the DNAPL has a low solubility and does not mix well with groundwater, the dissolved plume area is relatively small and is found in the area immediately adjacent to the DNAPL. The DNAPL and the portion of the dissolved phase plume which is immediately adjacent to the DNAPL is referred to as the “DNAPL Zone.” All DNAPL is believed to be in the DNAPL Zone illustrated on Figure 55. The DNAPL Zone has a spatial extent of approximately seven acres and a depth of 160 feet below ground surface as illustrated on Figure 56. The dissolved phase plume discharges to the Susquehanna River where it is quickly diluted to significantly less than Pennsylvania water quality standards (USEPA Region 3 2016). Figure 55. Plan view showing extent of groundwater designated in the TI waiver (Charsky et al. 2012). Figure 56. Cross section view showing extent of groundwater designated in the TI Waiver (Charsky et al. 2012). The operation of cooling water wells in groundwater to the west of the facility by the Lancaster Water Authority has drawn a portion of the dissolved phase plume toward these wells. These wells supply cooling water to a pumping station which supplies Susquehanna River water for drinking water purposes. The cooling water comprises approximately 0.1% of the public water supply provided by the pumping station. The water supplied by the pumping station is treated to make it potable prior to being supplied to residents. ICs have been implemented for both soils and groundwater, restricting the site to industrial use and prohibiting use of groundwater under the site for drinking water. Because of early investigations which revealed the presence of VOCs, PAHs, heavy metals, and cyanide in soil, groundwater and surface water at the site, USEPA proposed the site for inclusion on the Superfund NPL in June 1993 and added the site to the NPL in May 1994 (USEPA 2007c). 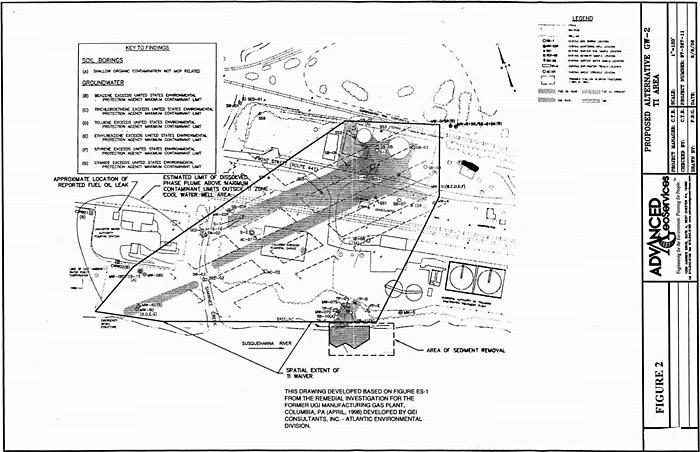 In April 1996, PP&L entered into a Consent Order and Agreement with Pennsylvania Department of Environmental Protection (PADEP) to conduct a Remedial Investigation/ Feasibility Study (RI/FS) to determine the nature and extent of contamination at the site, to characterize the risks to human health and the environment, to evaluate alternatives to clean up the contamination at the site, and to initiate interim actions on the gas and relief holders and for the Susquehanna River (USEPA 2007c). In 1997, PP&L applied steam and hot water injection to the two gas and relief holders. In addition, approximately 3,350 gallons of tar were extracted from the two holders and taken for off-site thermal treatment and disposal. Following the tar extraction, coal tar remained in subsurface soils below the holders. The holders were then injected with over 760 cubic yards of a grout and cement mixture to stabilize and solidify them. In addition, in 1998, approximately 700 tons of contaminated sediments were removed from the Susquehanna River and shipped off site for thermal treatment and disposal. A sheet pile wall was installed along the river bank in the area adjacent to the sediments. The area was regraded and covered with a geosynthetic cloth, rock, and stone. In April 1998, PADEP approved the Remedial Investigation (RI) and in June 1998, it approved a Risk Assessment Report. The RI identified approximately 15,000 cubic yards of contaminated surface and subsurface soil on site. The RI also identified contamination in on-site groundwater that had migrated off site and was detected in deep groundwater near the Susquehanna River. In 2002, PADEP approved PP&L’s FS Report, which determined options for addressing the remaining contamination at the Site. In October 2006, USEPA approved a Groundwater Engineering Analysis Report (Groundwater Report) for the site. In the Groundwater Report, PP&L provided documentation for a request for a TI waiver for the ARARs for groundwater due to the presence of DNAPL in the fractured bedrock under the MGP facility. The MGP-related wastes form the DNAPL under the MGP facility. On November 29, 2006, PP&L, UGI, and USEPA entered into an Administrative Settlement and Order on Consent. Under the Settlement Agreement, PPL and UGI agreed to, among other things, install caps over two areas where MGP-related wastes remained on site and excavate and dispose of soil and MGP-related wastes as necessary. In 2007, USEPA issued the ROD for the site (USEPA 2007c). Remedy for soils includes maintenance of the capping agreed to in the 2006 settlement Agreement, and ICs restricting use of the site to industrial use. MGP Facility – land and groundwater use restrictions. Remedy for groundwater includes the monitored natural gradient flushing (contaminants from the dissolved plume associated with DNAPL migrate and merge with the Susquehanna River where they are diluted to below water quality standards) with institutional controls, TI Waiver for the DNAPL zone, and continued groundwater monitoring to verify that the remedy is operating as expected. ICs consist of local zoning restrictions prohibiting installation of new wells, restrictions, or notices on site property deeds regarding the extraction and use of groundwater for any purpose, and permanent access to site wells for monitoring purposes (USEPA 2016c). CERCLA requires that any remedy selected to address contamination at a hazardous waste site must be protective of public health and welfare and the environment, be cost-effective, be in compliance with regulatory and statutory provisions that are ARARs, and consistent with the NCP to the extent practicable. The ROD for the site provided a detailed analysis of the remedial alternatives for soil and groundwater. Two alternatives for soil were evaluated: no action and no further action and ICs. The purpose of the no action alternative is to provide a baseline for comparison against the other alternatives. Under this alternative, no remedial action would be taken to remove, control migration from, minimize exposure to or otherwise reduce the risks associated with site-related contaminated soils. In addition, no efforts would be made to control the future use of the areas containing contaminated soils. This alternative controls risks through the implementation of ICs to maintain the integrity and protectiveness of the remedial actions previously taken at the site. The no further action and ICs alternative requires no further remediation of on-site soils because those areas where MGP-related waste remains in the soil have been capped. To ensure that the integrity and protectiveness of those caps are maintained, this alternative requires that the responsible parties to maintain the caps and implement ICs at the site. This alternative would allow for the commercial and industrial reuse of the site. Because contaminated soils would remain in place under the caps at the site, USEPA would conduct five-year reviews as required by Section 121(c) of CERCLA. This alternative was selected by USEPA. The no further action and ICs met the NCP criteria for overall protection of human health and the environment, long-term effectiveness and permanence, short-term effectiveness, implementability, state acceptance and community acceptance, and was the alternative selected for soil in the ROD (USEPA 2007c). The alternatives for groundwater included no action, monitored natural gradient flushing and institutional controls, and groundwater extraction and treatment. The monitored natural gradient flushing and institutional controls alternative consists of a TI Waiver in the seven -acre area shown on Figure 55 and referred to as the DNAPL Zone, and natural gradient flushing of the dissolved phase plume from the DNAPL Zone into the Susquehanna River. With natural gradient flushing, the dissolved MGP constituents will continue to be diluted, dispersed, and biodegraded to nondetectable levels in the Susquehanna River. This natural flushing effectively contains the plume and prevents it from expanding. The ICs component of this alternative consists of administrative and legal controls that help to minimize human exposure to contaminated groundwater. Groundwater extraction and treatment includes the extraction and treatment of the dissolved phase plume to hydraulically control the contaminated groundwater and prevent the migration of the dissolved plume towards the cooling water wells and the Susquehanna River. Groundwater extracted would be treated and discharged to the Susquehanna River. A TI Waiver would be established for the portion of the plume contained within the DNAPL zone. Monitored natural gradient flushing and institutional controls met the NCP criteria for overall protection of human health and the environment, short term effectiveness, implementability, costs and was the alternative selected for groundwater in the ROD. Primary reason: Presence of a large amount of viscous residual DNAPL in fractured rock, that will slowly dissolve over centuries. Secondary reasons: No known technologies to address residual DNAPL in fractured rock; attempts to mobilize DNAPL may cause ecological and human health risks. The TI waiver was part of the original ROD (a front-end waiver). The TI evaluation report was part of the 2006 Groundwater Engineering Analysis report, issued four years after the RI/FS and one year before the ROD. ARARs waived included federal MCLs and state risk-based concentration ARARs. 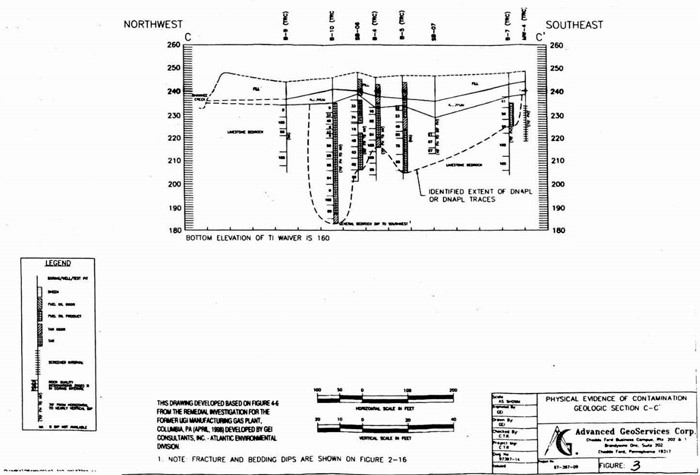 The TI zone includes the DNAPL zone (about 6 acres) to a depth of 160 feet (overburden, shallow, and deep bedrock). This zone also includes the site and off-site areas to the south and west. The data used as a basis for waiver was presented in the RI/FS report and post-FS analysis. This site required 15 years of characterization and is expected to require a remedy time frame of several centuries to 1,000 years, based on DNAPL dissolution. The present worth cost estimate ranges from $0.9 to $10 M for groundwater remediation. The ROD was public noticed in 2007 and public concerns were addressed in the Responsiveness Summary. A public meeting was held on July 19, 2007. The first Five-Year Review Report for UGI Columbia Gas Plant site was dated May 2016 (USEPA 2016c). The report concluded that the remedy is protective of human health and the environment in the short-term due to concrete and asphalt caps that prevent unacceptable exposure from occurring. The report suggested the following three actions to take to enhance remedy protectiveness over the long-term (USEPA 2016c). Evaluate soil and groundwater institutional controls for the Site contamination and modify or add controls, as necessary. Evaluate groundwater data and DNAPL extent to determine whether an alternate remedial method for groundwater is necessary. Continue monitoring manganese and cyanide concentrations to establish trends and to determine whether unacceptable ecological risk is present. Groundwater and land use controls were established by the 2007 Restrictive Covenants and 2009 Environmental Covenant on several Site properties. The five-year review report found that not all properties had the necessary ICs in place to restrict groundwater use and to prevent residential use. ICs need to be implemented for all properties at the Site to ensure the long-term protectiveness of the remedy. The five-year review report also reported that USEPA had achieved the RAO of preventing exposure to contaminated soil and groundwater and was working toward achieving the RAOs of preventing migration of the dissolved groundwater contamination and fully implementing institutional controls. Toxicity factors had changed since the 2007 ROD, causing some of the groundwater ARAR values to change. However, the changes in toxicity did not impact the protectiveness of the groundwater remedy. Groundwater contaminant concentrations outside the DNAPL Zone in the LWA Lobe and at MW-5(T) currently exceed groundwater ARARs. USEPA is currently evaluating if additional groundwater response actions are warranted or if the boundary of the DNAPL Zone needs to be modified (USEPA 2016c).